Paige Renkoski was a substitute teacher who lived in DeWitt Township, Clinton County, MI, with her fiance. 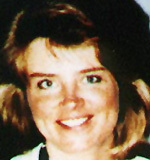 On the morning of May 24, 1990, she drove her mother to Detroit Metropolitan Airport. After Paige dropped her mother off, she headed back home, stopping at a friend’s house in Canton Township, Wayne County, MI, for a short visit. She left there and headed back to the Lansing area. Witnesses reported seeing Paige’s car on Interstate 96, weaving in and out of traffic, closely followed by a burgandy minivan. Other witnesses saw her alongside Interstate 96 at around 3:30 p.m., talking to two black males who were standing near a burgandy or maroon van. Around 8 p.m. the car Paige was driving was found on I-96 near Fowlerville. The engine was still running, and Paige’s purse, shoes, and an open bottle of beer were found inside. She has not been seen nor heard from since that day. (August, 2009) A three member task force has re-opened Paige’s case, identifying six possible suspects. Posted on Tuesday, February 3rd, 2009 at 2:23 pm. Last updated on Thursday, February 24th, 2011 at 5:33 pm.